The modern IT system is a multi-element environment, which requires constant management and monitoring in order to fully enable the use of its resources. The maintenance of IT resources while ensuring a high level of their security is key for business. We manage the IT systems of our Customers, using modern technologies, knowledge and experience. We ensure the proper maintenance of tele-information infrastructure and create an efficient, productive and friendly environment for the users. Thanks to our team you will be sure that your IT system functions faultlessly, the processed data is safe, and applications are permanently available for users. Trust our experience, knowledge and competencies. Your business deserves professional assistance. WHY DOES IT MAKE SENSE TO OUTSOURCE THE MANAGEMENT OF IT SYSTEMS? LEAVE THE ORGANIZATION OF YOUR IT DEPARTMENT TO US? IT TAKES A LOT OF TIME AND MONEY TO MAINTAIN HIGH IT COMPETENCES IN-HOUSE... WE WILL ALLOW YOU TO FOCUS ON YOUR BUSINESS. GAIN A SOLID AND COMPETENENT PARTNER, READY TO SUPPORT YOUR BUSINESS IN THE FIELD OF IT. The IT outsourcing services are a simple and effective manner for setting up an external IT department, which results in a streamlined organization and reduced costs. Gain time for your customers and focus on key areas of your business. We develop the IT policy for enterprises, ensure its implementation based on renowned methodology and our own set of good practices and know-how, based on 20 years of experience in computerization of enterprises. Our goal is to ensure a complete range of IT services, performed by a group of dedicated specialists, competent in all areas of the IT solution being used. WHEN IS THE BEST TIME TO USE IT OUTSOURCING SERVICES? WHEN YOUR COMPANY ENTERS A NEW DEVELOPMENT PHASE, WHICH RESULTS IN THE NEED TO IMPLEMENT NEW IT SOLUTIONS, AND YOUR TEAM LACKS SPECIALIZED EMPLOYEES - AND ACQUIRING THEM MEANS HUGE EFFORT AND COSTS. The CIO is the person in charge of the IT department, whose main goal is to build a strong relationship between IT and business. He or she manages the fulfillment of tasks of the IT department, evaluates existing and future requirements of the company, and supervises the projects and processes of IT systems integration. Our CIO can play an exceptional role at your company, assisting you in achieving operational excellence, ensuring the necessary support and optimum functioning of your IT system. Moreover, he will supply innovative solutions for your business. OUR CIO WILL USE HIS TALENTS AND EXPERIENCE TO PUT YOUR IDEAS INTO EFFECT. The network administration service is dedicated for those customers who value faultless operation, expect preventive actions in the event of a breakdown, and most importantly, require preventive measures to avoid future problems, plus continuous monitoring. We ensure professional care over the building blocks of your IT system, to uphold its maximum efficiency, availability and protection. We will care for the operational maintenance and continued development of your IT infrastructure. The correct functioning of an enterprise depends upon its access to efficiently operating IT tools. Solid IT support and back-up allows companies to efficiently achieve their business goals. Even a small breakdown leads to reduced dynamics of users and can result in lost profits of the enterprise. We offer permanent IT support – the helpdesk – for our customers and their employees. It involves the solving of everyday operating problems.. Contact with users takes place via modern communication channels, such as service request support systems and remote help. 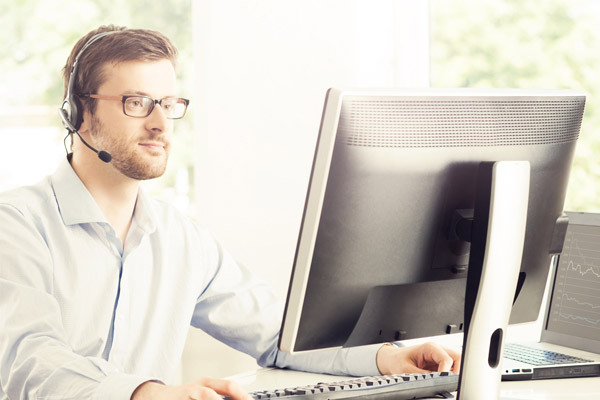 The helpdesk is an indispensable tool if you need our assistance immediately.